These two works of art are clearly different from each other and I think their differences say a lot about the owners themselves. 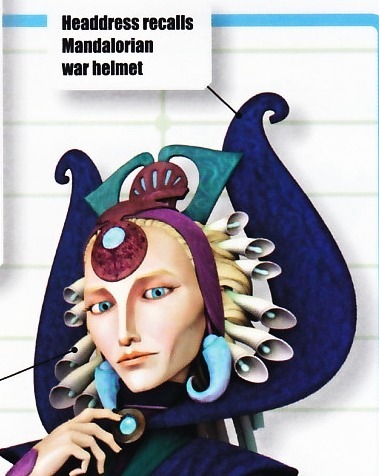 During the episode, Satine told Kenobi that Mandalorians who don’t like new, pacifist way of her are those who “idolize violence and the Warrior ways of the past”. For me, the painting alone is less about violence and more, I dare to say, presenting the ideal Mandalorian (Warrior). Let’s look closer at the characters and surrounding them details. The Jedi and supposed soldier of Republic (or maybe New Mandalorian allied with enemy?) were painted like caricature - their bodies are deformed (big head, unnaturally long neck, in general a disproportionate body) while at the same time, they are much smaller than central figure. The body of Mandalorian may be hide under the cloak, but it’s presented as straightened. Hand that is stopping blast from enemy weapon has fingers not bent nor swollen(?) like those of Jedi / Republic (or New Mandalorians / traitors). There is no expression to read due to helmet, yet the Figure seems to be in control of situation. The Mandalorian even is towering over enemies. Of course, one may say, hey, that just how cube painting style is but Mandalorian Figure alone is not presented like that. Such contrast makes it clear whom the artist favored. The next detail with great importance is the sword in Mandalorian Figure’s hand. Sword is a weapon of warriors but in contrast to falling down lightsaber of Jedi, it’s held firmly. The Jedi himself is falling down, even though there is no visible injury and sword is not pointed against any foe. Maybe Mandalorian Warrior disarmed him, maybe the (caricature of) Jedi is meant to look incompetent, hard to tell for sure. What is also worth to mention, (Legends) Mandalorians believed in three gods, in which one of “trinity” was known as Kad Ha’rangir who was the most important for Taungs (the first Mandalorians) and the future warriors. Kad literally means a sword and traditional weapon like that was quite popular between human Mandalorian warriors while in contrast two most known Mandalores of the past were using axes or similar two-handed weapon. Such detail gives impression that Mandalorian Figure is NOT invading force. On the contrary! Mandalorian Warrior is protecting the City (Society) against Jedi and Republic (or Mandalorians that allied themselves with enemy) thus the violence on Warrior part isn’t negative. The sole Figure acts as a defender and the role of Protector has great importance in Mandalorian Society, as those who protect Mandalore Sector on daily basis. In the background the city outline can be seen and with that floating smoke. Above that two ships looking like Mandalorian starfighters are flying yet there is no enemy spacecrafts around. Maybe the air battle is already won while the Mandalorien Figure is fighting the last enemies? Thus Mandalorian City (Society) is saved from Jedi and Republic (evil) forces. That is why I think the painting is not idolising violence, more like the strength of Mandalorian Warrior/Protector. The ability to push back Jedi/Republic attack and to stay independent, something that Pre (and with him Death Watch) wanted achieve, wanted take pride in. The Mandalorian Figure may be unnamed hero from one of mandalorian myths or someone sanctified - looking at the specific “halo” around Mandalorian’s head - maybe even a god. It makes sense that warrior like Pre would chose such painting, where Mandalorian is strong enough to defeat enemy, to protect Mandalorian city (society). It fit Vizsla’s ideology how only strong can rule but at the same time, it gives impression like Pre is believing in something bigger than one person’s ego, bigger than one man. Maybe Pre identified himself with the Mandalorian Figure, as the protector of Mandalorian People (society that is now slowly erased / destroyed by Satine’s pacifist rule)? Especially around time of The Mandalore Plot, when Vizsla is still ideological and to some degree naive in trusting Dooku? In contrast, the first thing Kenobi saw entering the throne room was Satine’s portrait. Of course, it makes sense for a Duchess to have paintings presenting her, nothing new. It is less about Satine’s vanity and more one of tools to present her as confident, strong ruler. But at the same time, the painting leaves me with torn feelings, ya know? This is my own opinion, feel to disagree, but Satine’s painting gives, well, nothing much to focus. 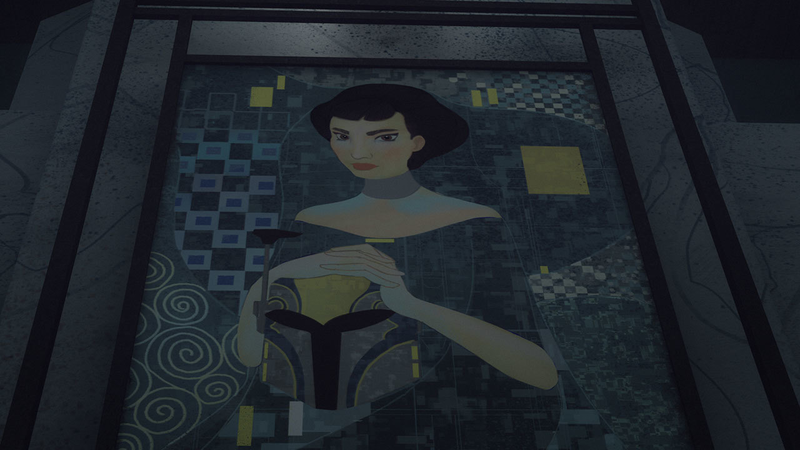 Beside the one questionable detail, we don’t see any elements related to Mandalorian culture (like in previous painting, the wall with characteristic embellishment, or ships in shape of Mandalorian starfighters or Mandalorian helm/T-shaped visor). It’s all about Satine, but the painting alone does not tell much about her as person. Beside that she played a key role - what in the painting the sitting(?) position on Throne(?) only highlight. In a way, this makes Duchess pacifist ideology introduced in episode quite one-sided, almost egoistic. Satine is sole ruler - whatever she is thinking or planning, it’s her vision of Mandalore, her philosophy that is not visible connected to anything (anyone) else. Ursa Wren is another (female) ruler, the head of Clan Wren. She is a key figure (that highlight her authority / high position) but the helm is visibly and not subtle statement of her warrior nature AND affiliation to Mandalorian Warriors (DW). 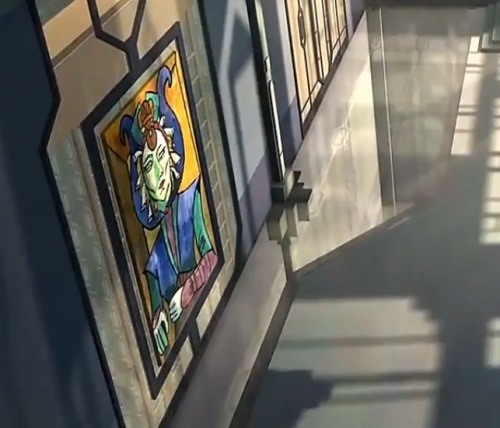 Between those two works of art, Ursa is the one that I don’t need to think twice to see who she is, while Satine, well, her portrait does not speak much about her and I literally needed additional source (TCW Character Encyclopedia) to see any connection between Duchess and Mandalore and her people. Maybe it’s intentional who knows? Maybe it was meant to show she abandoned her (warrior) heriatage in favor of her own, pacifist ideology. I don’t have an idea. I know only that if those two paintings were meant to representing in symbolic way Pre and Satine, it feels to me that Vizsla - around that time at least - is believing in something beside himself (the ideal of warrior, the role of protector and who knows, maybe even keep faith of his ancestors) while Kryze is lacking (visible) connection to her people, to their common history and culture. Frankly, one could say, the painting presents Satine as uncaring (egosticial maybe even?) for other people’s beliefs for the lack of (visible) connection to Mandalorians under her rule. • Maul took Satine’s portrait with himself, it could be seen in his hideout in Rebels. He took her life as well. He robbed her literally from everything. And we see her worn-out portrait as a trophy of Maul, the victim (reminder) of his hate for Kenobi. A hate, for which Satine was killed. • Pre couldn’t took the art with him, when Death Watch was running away from Concordia in The Mandalorian Plot. 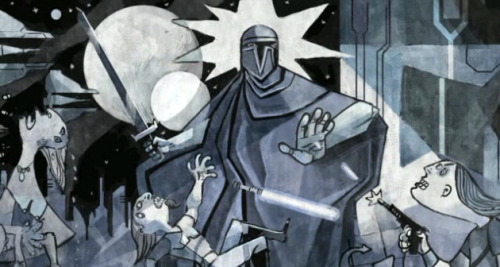 Like I said above, the painting doesn’t seem to me as a praise of violence, more like putting on a pedestal the Protector of Mandalore City (society). Something that Death Watch may supposedly be in then idealistic Pre’s mind. The art presenting the ideal was abandoned - and so was his naivety and dreams. Warworn Vizsla still kept to Warrior Way but with passing time he took more brutal approach to achieve the goal; burned village full of people, even allied himself with Sith/Dark Side Warriors to overthrown Satine’s rule and bring back Mandalorians to their warrior roots. The experience gained during the period of exile and war for sure challenged his ideals - the naive beliefs have been abandoned just like the painting. 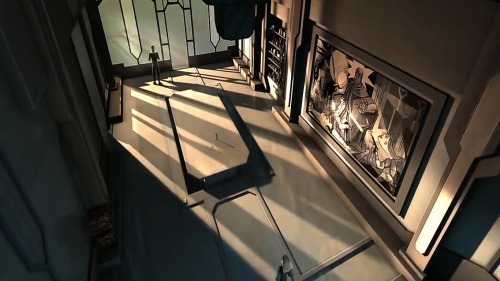 And the same as the art, Pre is forgotten by the newest sources like Star Wars:Rebels.